1948 - Chingford Town join the Southern League and finish 21st (out of 22) and 24th (out of 24) in the two subsequent seasons. Eight teams from the 1948/49 season have since gone on to join The Football League. 1950/51 - Withdrew from the Southern League and first team take over Reserve team fixtures in the Metropolitan League. Town reached the 2nd Qualifying Round of the FA Cup where they lose to local rival's Woodford Town in a home replay 0-4. They beat Ilford and Crittall Athletic to reach this stage which is the furthest the club ever got in it's short history. 1952/53 - Parkhill (Chingford) enter the London League. There is a Parkhill Road in E4 which is just at the top of Kings Head Hill which is where this name may originate. 1963/64 - Chingford FC play in the Metropolitan League Division Two for one season. 1975 - Chingford FC are founder members of the London Spartan League which is formed when 'Metropolitan London League and 'Spartan League' merge. 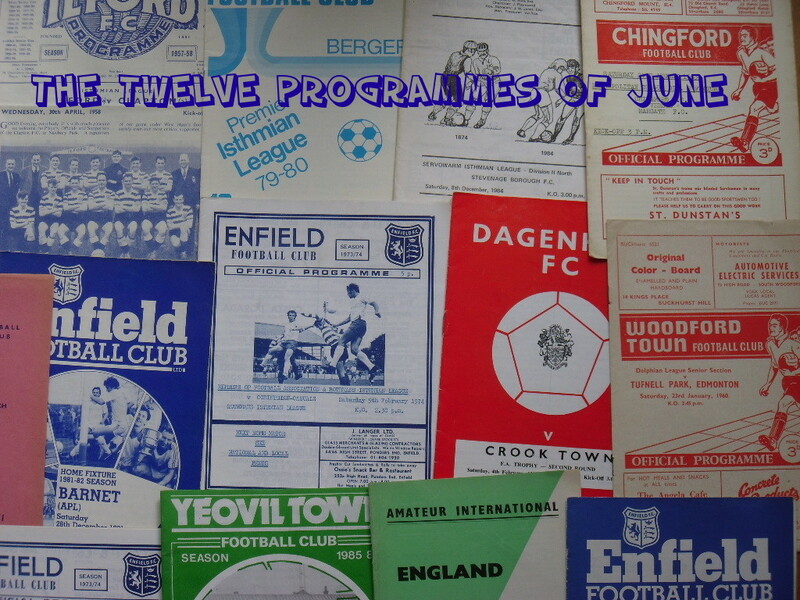 1979/80 - Chingford FC finish 5th in the Premier Division (the highest position in their 11 season stay)...competed against teams such at Berkhamsted Town, Amersham Town, Merstham, Fisher Athletic (who finished 8th) and Kingsbury Town amongst others. 1998/99 - Chingford Town leave SSML after finishing bottom of the table and conceding 174 goals in just 24 games. 1999 - Chingford Town join the London Intermediate League and compete for three seasons until 2002. 2010 - Chingford Town whom had been playing in the GA Roberts Enfield Alliance withdraw from the League after failing to fulfill their fixtures. 2011/12 - Chingford Athletic move up the pyramid and join the Essex Olympian League finishing 9th in Division Three. The club also moves to the Matchday Centre aka Wadham Lodge. This fixture was played in the Metropolitan League Division Two and it was against the reserve side of Margate as at the time their first team played in the Southern League. The Metropolitan League was formed in 1949 and went on until 1975 when a merger with the Spartan League created the London Spartan League. It had been named the Metropolitan-London League from 1971 to 1975 after a merger with The Greater London League. The league featured many football league 'A' sides during the 1950's and 1960's with Chelsea, Arsenal, Tottenham Hotspur and Charlton Athletic all wining the league title in this period. The winners of the last Metropolitan League in 1971 were Epping Town with Cray Wanderers winning the 1975 Metropolitan-London League. The wikipedia page for the league is full of lots of nice information here. It's not just football in the local area which has unfortunately seen stadiums disappear, as more famously the nearby Walthamstow Dog Stadium has very sadly stood empty and unused since August 2008. At one point in time there were 33 greyhound tracks in London but now only Romford, Wimbldeon and Crayford remain. As this Waltham Forest Guardian article reports (from Tuesday 8th May 2012) planning permission for the building of a housing estate have been passed. The Save Our Stow website also has news on the current status of the site. The current status is that the approved application has to be referred to London Mayor Boris Johnson and the Greater London Assembly. What will happen is still unknown?? I was reading your post from June 2012 about Chingford football club who played at the Newgate Sreet N4 location. My dad, Henry Howard, played on that now overgrown ground in mid 1950's. He's now 93 yrs old. I used to go watch him play when I was about 5-8 yrs old. I'm 66 now. Sometimes before the game, we had to chase the cows off the pitch who had strayed onto the playing field to eat the grass. * My dad was born and grew up near the Tottenham not far from the Spurs football ground. * He played his first game for Park Hill FC over the Tottenham Marshes in 1948-49. * He thinks the name came from Downhills Park nr Turnpike Lane. * The team eventually moved to play in Cheshunt in early 50's, still Park Hill FC. * My dad became the club secretary. Now the amazing stuff, at least I think so. * My dad's mother had a brother called Steven King; so my dad's uncle. * Turns out a friend of Steven King owned the ground on Newgate Street N4 where Ching. FC played until they folded in 1951. * When Ching FC folded, "Uncle Steven" asked his nephew Henry if he'd like his football team to play on the Chingford ground, and my dad said yes. So the team, still Park Hill, moved to Newgate Street. * Apparently there was another team then called Chingford Wednesdays (yes, like Sheffield.) He got word the team were thinking of changing their name to Chingford, dropping the Wednesday. So while Wednesday's dithered, my dad telephoned the FA and registered a request to formerly change Park Hill FC to Chingford FC. The best part is that my dad still has his runners-up medal from 1954-55. Photo's attached. Would upload pic of the medal but didn't see a button.